Ever since presenting on C++ AMP at the AMD Fusion conference in June, then the Gamefest conference in August, and the BUILD conference in September, I've had numerous requests about my material from folks that want to re-deliver the same session. The C++ AMP session I put together has evolved over the 3 presentations to its final form that I used at BUILD, so that is the one I recommend you base yours on. Please get the slides and the recording from channel9 (I'll refer to slide numbers below). (slide 3, 04:18-08:18) Start with a demo, on my dual-GPU machine. I've been using the N-Body sample. (slide 4) Use an nvidia slide that has additional examples of performance improvements that customers enjoy with heterogeneous computing. (slide 5) Talk a bit about the differences today between CPU and GPU hardware, leading to the fact that these will continue to co-exist and that GPUs are great for data parallel algorithms, but not much else today. One is a jack of all trades and the other is a number cruncher. (slide 6) Use the APU example from amd, as one indication that the hardware space is still in motion, emphasizing that the C++ AMP solution is a data parallel API, not a GPU API. It has a future proof design for hardware we have yet to see. (slide 7) Provide more meta-data, as blogged about when I first introduced C++ AMP. (slide 9-11) Introduce C++ AMP coding with a simplistic array-addition algorithm – the slides speak for themselves. (Slide 14-16) array, array_view and comparison between them. (slide 22) bring it altogether with a matrix multiplication example. (slide 23-24) accelerator, and accelerator_view. (slide 26-29) Introduce tiling incl. 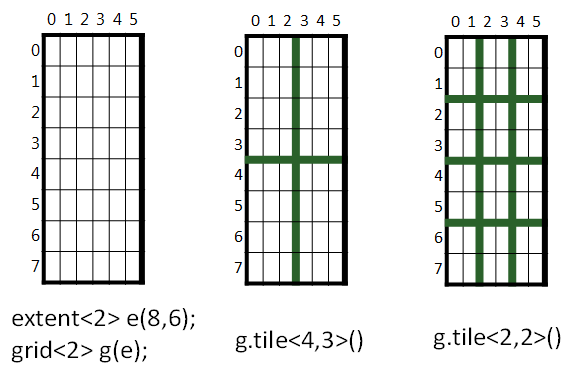 tiled matrix multiplication [tiling probably deserves a whole session instead of 6 minutes!]. (slide 34,37) Briefly touch on the concurrency visualizer. It supports GPU profiling, but enhancements specific to C++ AMP come at the Beta timeframe. 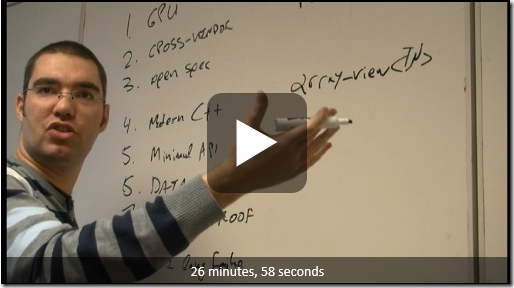 (slide 35-36, 51:54-59:16) Demonstrate the GPU debugging experience in VS 11. (slide 39) Re-iterate some of the points of slide 7, and add the point that C++ AMP is an open specification. (slide 40) Links to content – see slide – including where all your questions should go: http://social.msdn.microsoft.com/Forums/en/parallelcppnative/threads. The BUILD recording and slides are valid for the VS 11 Beta and beyond, with regards to C++ AMP - so watch the session and download those slides. Additionally, if you are going to repeat the session, I have updated the slides including some tweaks and you can download the updated deck here (note the slide numbers above do not map exactly to the new deck). "But I don't have time for a full blown session, I only need 2 (or just 1, or 3) C++ AMP slides to use in my session on related topic X"
If all you want is a small number of slides, you can take some from the session above and customize them. But because I am so nice, I have created some slides for you, including talking points in the notes section. Download them here. One of the FAQs we receive is whether C++ AMP can be used to target the CPU. For targeting multi-core we have a technology we released with VS2010 called PPL, which has had enhancements for VS 11 – that is what you should be using! FYI, it also has a Linux implementation via Intel's TBB which conforms to the same interface. When you choose to use C++ AMP, you choose to take advantage of massively parallel hardware, through accelerators like the GPU. 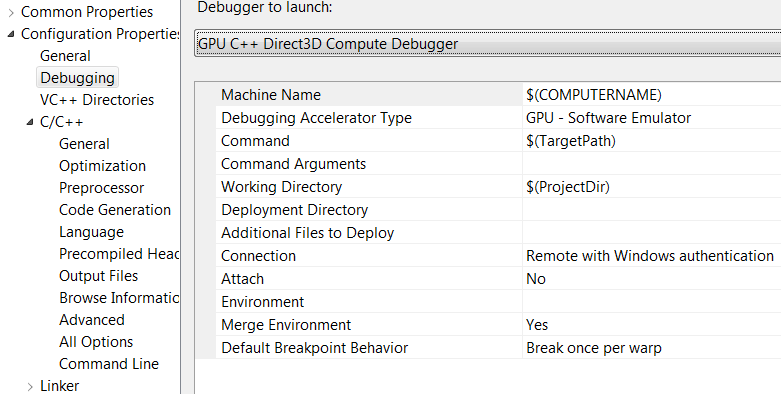 Having said that, you can always use the accelerator class to check if you are running on a system where the is no hardware with a DirectX 11 driver, and decide what alternative code path you wish to follow. In fact, if you do nothing in code, if the runtime does not find DX11 hardware to run your code on, it will choose the WARP accelerator which will run your code on the CPU, taking advantage of multi-core and SSE2 (depending on the CPU capabilities WARP also uses SSE3 and SSE 4.1 – it does not currently use AVX and on such systems you hopefully have a DX 11 GPU anyway). It is our fallback CPU solution, not intended as a primary target of C++ AMP. WARP stands for Windows Advanced Rasterization Platform and you can read old info on this MSDN page on WARP. What is new in Windows 8 Developer Preview is that WARP now supports DirectCompute, which is what C++ AMP builds on. It is not currently clear if we will have a CPU fallback solution for non-Windows 8 platforms when we ship. When you create a WARP accelerator, its is_emulated property returns true. WARP does not currently support double precision. BTW, when we refer to WARP, we refer to this accelerator described above. If we use lower case "warp", that refers to a bunch of threads that run concurrently in lock step and share the same instruction. In the VS 11 Developer Preview, the size of warp in our Ref emulator is 4 – Ref is another emulator that runs on the CPU, but it is extremely slow not intended for production, just for debugging. We ended the previous post with a mechanical transformation of the C++ AMP matrix multiplication example to the tiled model and in the process introduced tiled_index and tiled_extent. This is part 2. You all know that in regular CPU code, static variables have the same value regardless of which thread accesses the static variable. This is in contrast with non-static local variables, where each thread has its own copy. Back to C++ AMP, the same rules apply and each thread has its own value for local variables in your lambda, whereas all threads see the same global memory, which is the data they have access to via the array and array_view. Note that tile_static variables are scoped and have the lifetime of the tile, and they cannot have constructors or destructors. In amp.h one of the types introduced is tile_barrier. You cannot construct this object yourself (although if you had one, you could use a copy constructor to create another one). So how do you get one of these? You get it, from a tiled_index object. 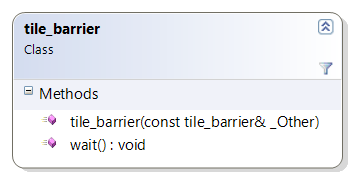 Beyond the 4 properties returning index objects, tiled_index has another property, barrier, that returns a tile_barrier object. The tile_barrier class exposes the method wait (and other wait overloads). …in the code above, all threads in the tile will reach line 16 before a single one progresses to line 17. Note that all threads must be able to reach the barrier, i.e. if you had branchy code in such a way which meant that there is a chance that not all threads could reach line 16, then the code above would be illegal. So now that we added to our understanding the concepts of tile_static and tile_barrier, let me obfuscate rewrite the matrix multiplication code so that it takes advantage of tile_static memory. Before you start reading this, I suggest you get a cup of your favorite non-alcoholic beverage to enjoy while you try to fully understand the code. Notice that all the code up to line 9 is the same as per the changes we made in part 1 of tiling introduction. If you squint, the body of the lambda itself preserves the original algorithm on lines 10, 11, and 17, 18, and 21. The difference being that those lines use new indexing and the tile_static arrays; the tile_static arrays are declared and initialized on the brand new lines 13-15. On those lines we copy from the global memory represented by the array_view objects (a and b), to the tile_static vanilla arrays (locA and locB) – we are copying enough to fit a tile. Because in the code that follows on line 18 we expect the data for this tile to be in the tile_static storage, we need to synchronize the threads within each tile with a barrier, which we do on line 16 (to avoid accessing uninitialized memory on line 18). We also need to synchronize the threads within a tile on line 19, again to avoid the race between lines 14, 15 (retrieving the next set of data for each tile and overwriting the previous set) and line 18 (not being done processing the previous set of data). 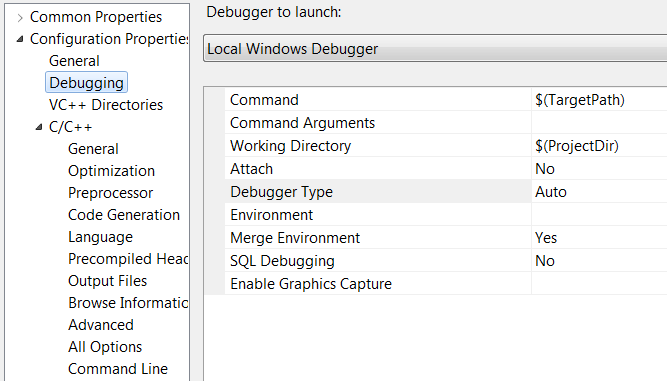 Luckily, as part of the awesome C++ AMP debugger in Visual Studio there is an option that helps you find such races, but that is a story for another blog post another time. May I suggest reading the next section, and then coming back to re-read and walk through this code with pen and paper to really grok what is going on, if you haven't already? Cool. Why would I introduce this tiling complexity into my code? Funny you should ask that, I was just about to tell you. There is only one reason we tiled our extent, had to deal with finding a good tile size, ensure the number of threads we schedule are correctly divisible with the tile size, had to use a tiled_index instead of a normal index, and had to understand tile_barrier and to figure out where we need to use it, and double the size of our lambda in terms of lines of code: the reason is to be able to use tile_static memory. Why do we want to use tile_static memory? Because accessing tile_static memory is around 10 times faster than accessing the global memory on an accelerator like the GPU, e.g. in the code above, if you can get 150GB/second accessing data from the array_view a, you can get 1500GB/second accessing the tile_static array locA. And since by definition you are dealing with really large data sets, the savings really pay off. We have seen tiled implementations being twice as fast as their non-tiled counterparts. Now, some algorithms will not have performance benefits from tiling (and in fact may deteriorate), e.g. algorithms that require you to go only once to global memory may not benefit from tiling, since with tiling you already have to fetch the data once from global memory! Other algorithms may benefit, but you may decide that you are happy with your code being 50 times faster than the serial-version you had, and you do not need to invest to make it 100 times faster. Also algorithms with more than 3 dimensions, which C++ AMP supports in the simple model, cannot be tiled. Also note that in future releases, we may invest in making the non-tiled model, which already uses tiling under the covers, go the extra step and use tile_static memory on your behalf, but it is obviously way to early to commit to anything like that, and we certainly don't do any of that today. This post assumes you are totally comfortable with, what some of us call, the simple model of C++ AMP, i.e. you could write your own matrix multiplication. We are now ready to explore the tiled model, which builds on top of the non-tiled one. We know that when we pass an extent to the parallel_for_each call, it determines the number of threads to schedule and their index values (including dimensionality). For the single-, two-, and three- dimensional cases you can go a step further and subdivide the threads into what we call tiles of threads (others may call them thread groups). …on the 2nd line we subdivided the single-dimensional space into 5 single-dimensional tiles each having 4 elements, and we captured that result in a concurrency::tiled_extent (a new class in amp.h). So we start on the left with a 2-dimensional extent which has 8*6=48 threads. We then have two different examples of tiling. In the first case, in the middle, we subdivide the 48 threads into tiles where each has 4*3=12 threads, hence we have 2*2=4 tiles. In the second example, on the right, we subdivide the original input into tiles where each has 2*2=4 threads, hence we have 4*3=12 tiles. Notice how you can play with the tile size and achieve different number of tiles. The numbers you pick must be such that the original total number of threads (in our example 48), remains the same, and every tile must have the same size. Of course, you still have no clue why you would do that, but stick with me. First, we should see how we can use this tiled_extent, since the parallel_for_each function that we know expects a extent. It turns out that we have additional overloads of parallel_for_each that accept a tiled_extent instead of a extent. However, those overloads, also expect that the lambda you pass in accepts a concurrency::tiled_index (new in amp.h), not an index<N>. So how is a tiled_index different to an index? Given the code above and the picture on the right, what are the values of each of the 4 index objects that the t_idx variables exposes, when the lambda is executed by T (highlighted in the picture on the right)? Don't move on until you are comfortable with this… the picture really helps, so use it. To turn this into a tiled example, first we need to decide our tile size. Let's say we want each tile to be 16*16 (which assumes that we'll have at least 256 threads to process, and that c.extent.size() is divisible by 256, and moreover that c.extent and c.extent are divisible by 16). So we insert at line 03 the tile size (which must be a compile time constant). ...and now this code just works and it is tiled! The process we followed just shows the mechanical transformation that can take place from the simple model to the tiled model (think of this as step 1). In fact, when we wrote the matrix multiplication example originally, the compiler was doing this mechanical transformation under the covers for us (and it has additional smarts to deal with the cases where the total number of threads scheduled is not divisible by the tile size). The point is that the thread scheduling is always tiled, even when you use the non-explicitly-tiled model. But with this mechanical transformation, we haven't gained anything… Hint: our goal with explicitly using the tiled model is to gain even more performance. As part of our API tour of C++ AMP, we looked recently at parallel_for_each. I ended that post by saying we would revisit parallel_for_each after introducing array and array_view. Now is the time, so this is part 2 of parallel_for_each, and also a post that brings together everything we've seen until now. First a visual comparison, just for fun: The beginning and end is the same, i.e. lines 0,1,12 are identical to lines 13,14,26. The double nested loop (lines 2,3,4,5 and 10,11) has been transformed into a parallel_for_each call (18,19,20 and 25). The core algorithm (lines 6,7,8,9) is essentially the same (lines 21,22,23,24). We have extra lines in the C++ AMP version (15,16,17). Now let's dig in deeper. When we decided to convert this function to run on an accelerator, we knew we couldn't use the std::vector objects in the restrict(amp) function. So we had a choice of copying the data to the the concurrency::array<T,N> object, or wrapping the vector container (and hence its data) with a concurrency::array_view<T,N> object from amp.h – here we used the latter (lines 15,16,17). Now we can access the same data through the array_view objects (a and b) instead of the vector objects (vA and vB), and the added benefit is that we can capture the array_view objects in the lambda (lines 19-25) that we pass to the parallel_for_each call (line 18) and the data will get copied on demand for us to the accelerator. In other words, we could have explicitly created the extent object instead of letting the array_view create it for us under the covers through the constructor overload we chose. The benefit of the extent object in this instance is that we can express that the data is indeed two dimensional, i.e a matrix. When we were using a vector object we could not do that, and instead we had to track via additional unrelated variables the dimensions of the matrix (i.e. with the integers M and W) – aren't you loving C++ AMP already? Note that the const before the float when creating a and b, will result in the underling data only being copied to the accelerator and not be copied back – a nice optimization. A similar thing is happening on line 17 when creating array_view c, where we have indicated that we do not need to copy the data to the accelerator, through the discard_data call. On line 18 we make the call to the C++ AMP entry point (parallel_for_each) to invoke our parallel loop or, as some may say, dispatch our kernel. The first argument we need to pass describes how many threads we want for this computation. For this algorithm we decided that we want exactly the same number of threads as the number of elements in the output matrix, i.e. in array_view c which will eventually update the vector vC. So each thread will compute exactly one result. Since the elements in c are organized in a 2-dimensional manner we can organize our threads in a two-dimensional manner too. We don't have to think too much about how to create the first argument (a extent) since the array_view object helpfully exposes that as a property. Note that instead of c.extent we could have written extent<2>(M, N) – the result is the same in that we have specified M*N threads to execute our lambda. The second argument is a restrict(amp) lambda that accepts an index object. Since we elected to use a two-dimensional extent as the first argument of parallel_for_each, the index will also be two-dimensional and as covered in the previous posts it represents the thread ID, which in our case maps perfectly to the index of each element in the resulting array_view. The lambda body (lines 20-24), or as some may say, the kernel, is the code that will actually execute on the accelerator. It will be called by M*N threads and we can use those threads to index into the two input array_views (a,b) and write results into the output array_view ( c ). The four lines (21-24) are essentially identical to the four lines of the serial algorithm (6-9). The only difference is how we index into a,b,c versus how we index into vA,vB,vC. The code we wrote with C++ AMP is much nicer in its indexing, because the dimensionality is a first class concept, so you don't have to do funny arithmetic calculating the index of where the next row starts, which you have to do when working with vectors directly (since they store all the data in a flat manner). ...and the rest of your code remains the same… how simple is that? This is a very long post, but it also covers what are probably the classes (well, array_view at least) that you will use the most with C++ AMP, so I hope you enjoy it! The concurrency::array and concurrency::array_view template classes represent multi-dimensional data of type T, of N dimensions, specified at compile time (and you can later access the number of dimensions via the rank property). If N is not specified, it is assumed that it is 1 (i.e. single-dimensional case). They are rectangular (not jagged). The difference between them is that array is a container of data, whereas array_view is a wrapper of a container of data. So in that respect, array behaves like an STL container, whereas the closest thing an array_view behaves like is an STL iterator (albeit with random access and allowing you to view more than one element at a time!). The data in the array (whether provided at creation time or added later) resides on an accelerator (which is specified at creation time either explicitly by the developer, or set to the default accelerator at creation time by the runtime) and is laid out contiguously in memory. The data provided to the array_view is not stored by/in the array_view, because the array_view is simply a view over the real source (which can reside on the CPU or other accelerator). The underlying data is copied on demand to wherever the array_view is accessed. Elements which differ by one in the least significant dimension of the array_view are adjacent in memory. array objects must be captured by reference into the lambda you pass to the parallel_for_each call, whereas array_view objects must be captured by value (into the lambda you pass to the parallel_for_each call). After you are done reading this post, feel free to visit another post dedicated to capturing data. 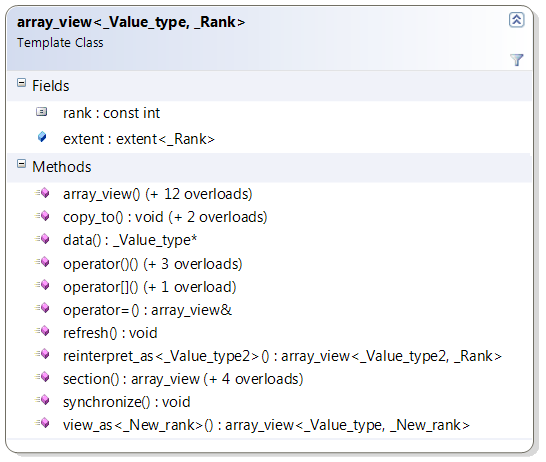 You can create array_view objects from other array_view objects of the same rank and element type (shallow copy, also possible via assignment operator) so they point to the same underlying data, and you can also create array_view objects over array objects of the same rank and element type e.g. Note: Unlike the constructors above which can be called anywhere, the ones in the rest of this section can only be called from CPU code. You can create array objects from other array objects of the same rank and element type (copy and move constructors) and from other array_view objects, e.g. To create an array from scratch, you need to at least specify an extent object, e.g. array<int,3> a(myExtent);. Note that instead of an explicit extent object, there are convenience overloads when N<=3 so you can specify 1-, 2-, 3- integers (dependent on the array's rank) and thus have the extent created for you under the covers. At any point, you can access the array's extent thought the extent property. The exact same thing applies to array_view (extent as constructor parameters, incl. convenience overloads, and property). While passing only an extent object to create an array is enough (it means that the array will be written to later), it is not enough for the array_view case which must always wrap over some other container (on which it relies for storage space and actual content). So in addition to the extent object (that describes the shape you'd like to be viewing/accessing that data through), to create an array_view from another container (e.g. std::vector) you must pass in the container itself (which must expose .data() and a .size() methods, e.g. like std::array does), e.g. Similarly, you can create an array_view from a raw pointer of data plus an extent object. Back to the array case, to optionally initialize the array with data, you can pass an iterator pointing to the start (and optionally one pointing to the end of the source container) e.g. We saw that arrays are bound to an accelerator at creation time, so in case you don’t want the C++ AMP runtime to assign the array to the default accelerator, all array constructors have overloads that let you pass an accelerator_view object, which you can later access via the accelerator_view property. 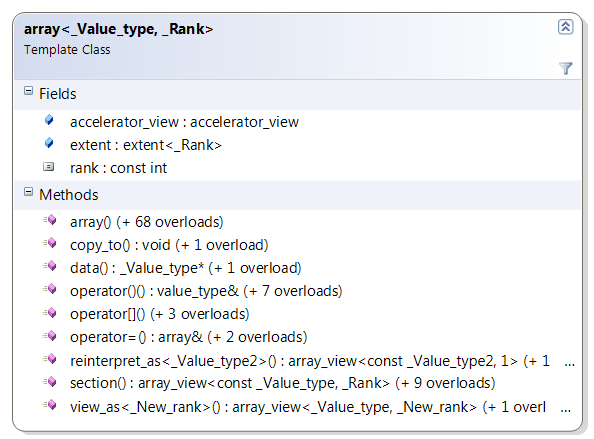 Note that in the previous section on constructors, unlike the array case, there was no overload that accepted an accelerator_view for array_view. That is because the array_view is simply a wrapper, so the allocation of the data has already taken place before you created the array_view. When you capture an array_view variable in your call to parallel_for_each, the copy of data between the non-CPU accelerator and the CPU takes place on demand (i.e. it is implicit, versus the explicit copy that has to happen with the array). There are some subtleties to the on-demand-copying that we cover next. Conversely, if you make a change to the underlying data through the original source (e.g. the pointer), the array_view will not "know" about those changes, unless you call its refresh method. Finally, note that if you create an array_view of const T, then the data is copied to the accelerator on demand, but it does not get copied back, e.g. There is also a similar mechanism to achieve the reverse, i.e. not to copy the data of an array_view to the GPU. Both array and array_view expose two copy_to overloads that allow copying them to another array, or to another array_view, and these operations can also be achieved with assignment (via the = operator overloads). Also both array and array_view expose a data method, to get a raw pointer to the underlying data of the array or array_view, e.g. float* f = myArr.data();. Note that for array_view, this only works when the rank is equal to 1, due to the data only being contiguous in one dimension as covered in the overview section. Finally, there are a bunch of global concurrency::copy functions returning void (and corresponding concurrency::copy_async functions returning a future) that allow copying between arrays and array_views and iterators etc. Note that for array, all copying described throughout this post is deep copying, as per other STL container expectations. You can never have two arrays point to the same data. Reading or writing data elements of an array is only legal when the code executes on the same accelerator as where the array was bound to. In the array_view case, you can read/write on any accelerator, not just the one where the original data resides, and the data gets copied for you on demand. In both cases, the way you read and write individual elements is via indexing as described next. To access (or set the value of) an element, you can index into it by passing it an index object via the subscript operator. Furthermore, if the rank is 3 or less, you can use the function ( ) operator to pass integer values instead of having to use an index object. e.g. //and the reverse for assigning, e.g. Note that for both array and array_view, regardless of rank, you can also pass a single integer to the subscript operator which results in a projection of the data, and (for both array and array_view) you get back an array_view of rank N-1 (or if the rank was 1, you get back just the element at that location). In this already very long post, I am not going to cover three very cool methods (and related overloads) that both array and array_view expose: view_as, section, reinterpret_as. We'll revisit those at some point in the future, probably on the team blog. This posts assumes that you've read my other C++ AMP posts on index<N> and extent<N>, as well as about the restrict modifier. It also assumes you are familiar with C++ lambdas (if not, follow my links to C++ documentation). The parallel_for_each will execute the body of the lambda (which must have the restrict modifier), on the GPU. We also call the lambda body the "kernel". The kernel will be executed multiple times, once per scheduled GPU thread. The only difference in each execution is the value of the index object (aka as the GPU thread ID in this context) that gets passed to your kernel code. The number of GPU threads (and the values of each index) is determined by the extent object you pass, as described next. So what the above means is that the lambda body with the algorithm that you wrote will get executed 6 times and the index<2> object you receive each time will have one of the values just listed above (of course, each one will only appear once, the order is indeterminate, and they are likely to call your code at the same exact time). Obviously, in real GPU programming, you'd typically be scheduling thousands if not millions of threads, not just 6. 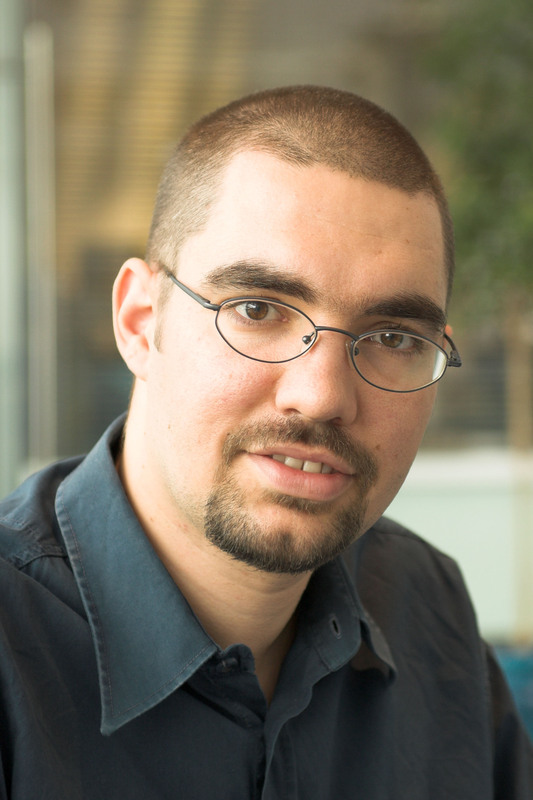 If you've been following along you should be thinking: "that is all fine and makes sense, but what can I do in the kernel since I passed nothing else meaningful to it, and it is not returning any values out to me?" It is a good question, and in data parallel algorithms indeed you typically want to pass some data in, perform some operation, and then typically return some results out. The way you pass data into the kernel, is by capturing variables in the lambda (again, if you are not familiar with them, follow the links about C++ lambdas), and the way you use data after the kernel is done executing is simply by using those same variables. In the example above, the lambda was written in a fairly useless way with an empty capture list: [ ](index<2> idx) restrict(amp), where the empty square brackets means that no variables were captured. If instead I write it like this [&](index<2> idx) restrict(amp), then all variables in the some_code_A region are made available to the lambda by reference, but as soon as I try to use any of those variables in the lambda, I will receive a compiler error. This has to do with one of the amp restrictions, where essentially only one type can be captured by reference: objects of the new concurrency::array class that I'll introduce in the next post (suffice for now to think of it as a container of data). If I write the lambda line like this [=](index<2> idx) restrict(amp), all variables in the some_code_A region are made available to the lambda by value. This works for some types (e.g. an integer), but not for all, as per the restrictions for amp. In particular, no useful data classes work except for one new type we introduce with C++ AMP: objects of the new concurrency::array_view class, that I'll also introduce in the next post. Also note that if you capture some variable by value, you could use it as input to your algorithm, but you wouldn’t be able to observe changes to it after the parallel_for_each call (e.g. in some_code_B region since it was passed by value) – the exception to this rule is the array_view since (as we'll see in a future post) it is a wrapper for data, not a container. Finally, for completeness, you can write your lambda, e.g. like this [av, &ar](index<2> idx) restrict(amp) where av is a variable of type array_view and ar is a variable of type array - the point being you can be very specific about what variables you capture and how. Please note that the parallel_for_each executes as if synchronous to the calling code, but in reality, it is asynchronous. I.e. once the parallel_for_each call is made and the kernel has been passed to the runtime, the some_code_B region continues to execute immediately by the CPU thread, while in parallel the kernel is executed by the GPU threads. However, if you try to access the (array or array_view) data that you captured in the lambda in the some_code_B region, your code will block until the results become available. Hence the correct statement: the parallel_for_each is as-if synchronous in terms of visible side-effects, but asynchronous in reality. That's all for now, we'll revisit the parallel_for_each description, once we introduce properly array and array_view – coming next. We saw in a previous post how index<N> represents a point in N-dimensional space and in this post we'll see how to define the N-dimensional space itself. With C++ AMP, an N-dimensional space can be specified with the template class extent<N> where you define the size of each dimension. From a look and feel perspective, you'd expect the programmatic interface of a point type and size type to be similar (even though the concepts are different). Indeed, exactly like index<N>, extent<N> is essentially a coordinate vector of N integers ordered from most- to least- significant, BUT each integer represents the size for that dimension (and hence cannot be negative). There is the rank field returning the value of N you passed as the template parameter. You can construct one extent from another (via the copy constructor or the assignment operator), you can construct it by passing an integer array, or via convenience constructor overloads for 1- 2- and 3- dimension extents. Note that the parameterless constructor creates an extent of the specified rank with all bounds initialized to 0. You can access the components of the extent through the subscript operator (passing it an integer). You can perform some arithmetic operations between extent objects through operator overloading, i.e. ==, !=, +=, -=, +, -. There are operator overloads so that you can perform operations between an extent and an integer: -- (pre- and post- decrement), ++ (pre- and post- increment), %=, *=, /=, +=, –= and, finally, there are additional overloads for plus and minus (+,-) between extent<N> and index<N> objects, returning a new extent object as the result. In addition to the usual suspects, extent offers a contains function that tests if an index is within the bounds of the extent (assuming an origin of zero). It also has a size function that returns the total linear size of this extent<N> in units of elements. The extent class on its own simply defines the size of the N-dimensional space. We'll see in future posts that when you create containers (arrays) and wrappers (array_views) for your data, it is an extent<N> object that you'll need to use to create those (and use an index<N> object to index into them). We'll also see that it is a extent<N> object that you pass to the new parallel_for_each function that I'll cover in the next post. C++ AMP introduces a new template class index, where N can be any value greater than zero, that represents a unique point in N-dimensional space, e.g. if N=2 then an index<2> object represents a point in 2-dimensional space. This class is essentially a coordinate vector of N integers representing a position in space relative to the origin of that space. It is ordered from most-significant to least-significant (so, if the 2-dimensional space is rows and columns, the first component represents the rows). The underlying type is a signed 32-bit integer, and component values can be negative. 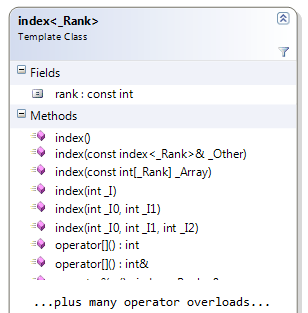 The rank field returns N.
The default parameterless constructor returns an index with each dimension set to zero, e.g. An index can also be created from another index through the copy constructor or assignment, e.g. Note that there are convenience constructors (that don’t require an array argument) for creating index objects of rank 1, 2, and 3, since those are the most common dimensions used, e.g. You can access each component using the familiar subscript operator, e.g. Once you have your multi-dimensional point represented in the index, you can now treat it as a single entity, including performing common operations between it and an integer (through operator overloading): -- (pre- and post- decrement), ++ (pre- and post- increment), %=, *=, /=, +=, -=,%, *, /, +, -. 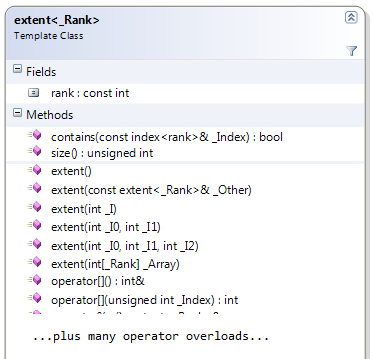 There are also operator overloads for operations between index objects, i.e. ==, !=, +=, -=, +, –. In the next post we'll go beyond being able to represent an N-dimensional point in space, and we'll see how to define the N-dimensional space itself through the extent<N> class. We saw previously that accelerator represents a target for our C++ AMP computation or memory allocation and that there is a notion of a default accelerator. We ended that post by introducing how one can obtain accelerator_view objects from an accelerator object through the accelerator class's default_view property and the create_view method. The accelerator_view objects can be thought of as handles to an accelerator. You can also construct an accelerator_view given another accelerator_view (through the copy constructor or the assignment operator overload). Speaking of operator overloading, you can also compare (for equality and inequality) two accelerator_view objects between them to determine if they refer to the same underlying accelerator. We'll see later that when we use concurrency::array objects, the allocation of data takes place on an accelerator at array construction time, so there is a constructor overload that accepts an accelerator_view object. We'll also see later that a new concurrency::parallel_for_each function overload can take an accelerator_view object, so it knows on what target to execute the computation (represented by a lambda that the parallel_for_each also accepts). Beyond normal usage, accelerator_view is a quality of service concept that offers isolation to multiple "consumers" of an accelerator. If in your code you are accessing the accelerator from multiple threads (or, in general, from different parts of your app), then you'll want to create separate accelerator_view objects for each thread. 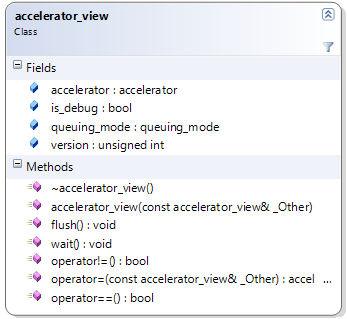 When you create an accelerator_view via the create_view method of the accelerator, you pass in an option of queuing_mode_immediate or queuing_mode_automatic, which are the two members of the queuing_mode enum. At any point you can access this value from the queuing_mode property of the accelerator_view. When the queuing_mode value is queuing_mode_automatic (which is the default), any commands sent to the device such as kernel invocations and data transfers (e.g. parallel_for_each and copy, as we'll see in future posts), will get submitted as soon as the runtime sees fit (that is the definition of immediate). When the value of queuing_mode is queuing_mode_immediate, the commands will be submitted/flushed immediately. To send all buffered commands to the device for execution, there is a non-blocking flush method that you can call. If you wish to block until all the commands have been sent, there is a wait method you can call (which also flushes). You can read more to understand C++ AMP's queuing_mode. Just like accelerator, accelerator_view exposes the is_debug and version properties. In fact, you can always access the accelerator object from the accelerator property on the accelerator_view class to access the accelerator interface we looked at previously. Accelerator also exposes a function that helps you stay aware of the progress of execution. 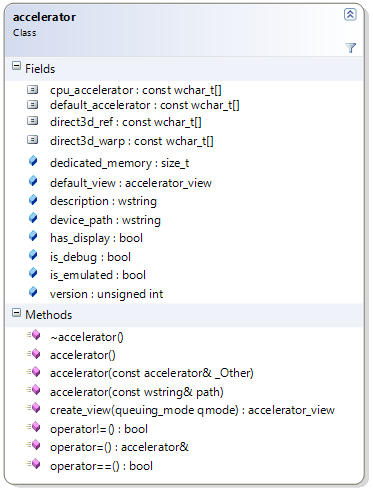 You can read more about accelerator_view::create_marker. If your app that uses C++ AMP to compute data also uses DirectX rendering shaders, e.g. pixel shaders, you can benefit by integrating C++ AMP into your graphics pipeline. One of the building blocks for that is being able to use the same device context from both the compute kernel and the other shaders. You can do that by going from accelerator_view to device context (and vice versa), through part of our interop API in amp.h: *get_device, create_accelerator_view. You can read more on DirectX interop. UPDATE: I encourage you to visit a newer and better post with a C++ AMP matrix multiplication example. Below is the before C++ AMP and after C++ AMP code. For more on what it all means, watch the recording of my C++ AMP introduction (the example below is part of the session). At AMD's Fusion conference Herb Sutter announced in his keynote session a technology that our team has been working on that we call C++ Accelerated Massive Parallelism (C++ AMP) and during the keynote I showed a brief demo of an app built with our technology. After the keynote, I go deeper into the technology in my breakout session. If you read both those abstracts, you'll get some information about what C++ AMP is, without being too explicit since we published the abstracts before the technology was announced. You can find the official online announcement at Soma's blog post. is designed not only to help you address today's massively parallel hardware (i.e. GPUs and APUs), but it also future proofs your code investments with a forward looking design. is part of Visual C++. You don't need to use a different compiler or learn different syntax. is integrated and supported fully in Visual Studio 11. 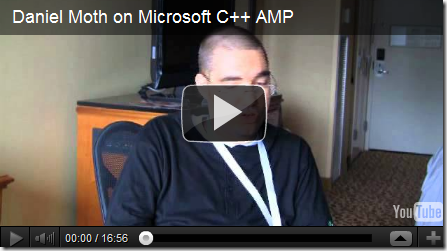 Editing, building, debugging, profiling and all the other goodness of Visual Studio work well with C++ AMP. introduces only one core C++ language extension. builds on DirectX (and DirectCompute in particular) which offers a great hardware abstraction layer that is ubiquitous and reliable. The architecture is such, that this point can be thought of as an implementation detail that does not surface to the API layer. Previously I shared resources to get you started with DirectCompute, for taking advantage of GPGPUs in an a way that doesn't tie you to a hardware vendor (e.g. nvidia, amd). I just stumbled upon and had to share a lecture series on channel9 on DirectCompute! TIP: To subscribe to channel9 GPU content, use this RSS feed. You know that I work on the parallel debugger in Visual Studio and I've talked about GPGPU before and I have also mentioned UX. Below is a request from my UX colleagues that pulls all of it together. If you write and debug parallel code that uses GPUs for non-graphical, computationally intensive operations keep reading. The Microsoft Visual Studio Parallel Computing team is seeking developers for a 90-minute research study. The study will take place via LiveMeeting or at a usability lab in Redmond, depending on your preference. The walkthrough utilizes a “paper” version of our current design. After the walkthrough, we would then show you some additional design ideas and seek your input on various design tradeoffs. Are you interested or know someone who might be a good fit? Let us know at this address: devur@microsoft.com. Those who participate (and those who referred them), will receive a gratuity item from a list of current Microsoft products.